Somewhere in an Indian village the earth begins to tremble in the middle of the night. The siblings Siri and Tissa run into the open. They watch the earth’s tremors with fascination and find out the reason for the earth quake from an old man on the following day: The death of the sublime Buddha has caused the commotion of the earth and the skies. But who was this Buddha, who allegedly was not a common person, but virtuous and perfect in every way? 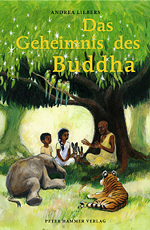 The old man tells the children the fascinating personal history of Buddha which begins with the little Prince Siddharta.